Tonight: the super wolf moon, fully eclipsed. The duration of the eclipse, from beginning to end, will be fully visible in the America’s. In Europe, the eclipse will occur in the wee hours of the morning on Monday, Jan 21. The eclipse will not be visible in Australia and Asia since it will be daytime. How much of the eclipse will be observed, of course, will depend upon the weather. Ideally, clear skies offer the best viewing opportunity. Not so good, those still experiencing the coast-to-coast winter storm. This eclipse promises to be one of the best, with its duration in totality lasting for 62 minutes. While no aid is required to watch tonight’s eclipse, a pair of binoculars will greatly aid the process and heighten its enjoyment. A telescope is okay too, especially if your viewing also includes planets and stars. For more information and times on tonight’s eclipse, please consult Sky and Telescope’s guide here. The anticipation is great. It’s been called the celestial event of the year, and more. And, it begins in a matter of hours. Its transcontinental path across America is most rare. Not rare is the zone of totality, about 67 miles wide. Outside the zone, a partial eclipse. For example, Grand Teton National Park, lies within the zone of totality but its immediate neighbor to the north, Yellowstone National Park, will experience a 99% partial eclipse. While the experience should be the same whether in Grand Teton or Yellowstone, it has been suggested it is not. Both places of nature’s grandeur will be dark regardless. If the plan is to directly observe the eclipse, partial or total, you will need to be properly equipped. The eclipse glasses or handheld viewers should be certified to meet the ISO 12312-2 standard. Many reputable outlets have already sold out their stock. One alternative is to make a DIY cardboard pinhole viewer. The pinhole viewer does work; it is a matter of practicing in the hours before the eclipse. Practice can also be done using a lamp as a substitute for the sun. The other direct view methods are a telescope or a welder’s lens. For a telescope, a sun filter that attaches to the eyepiece is needed or a sun projection screen. If it is a welder’s lens, a shade 14 lens should be used according to NASA. Anything less does not provide the necessary eye protection. Most welding supply stores have said a shade 14 lens is a special order item. If the plan also includes to photograph the eclipse, partial or total, you will need to have the proper filtering lens for your camera. A sun filter should be attached to the end of the zoom lens. The stacking of neutral density filters along with polarizing filters will not protect the camera sensor from damage. With the camera essentially turned into a refractor telescope, increasing the optical zoom will decrease its light gathering ability. It will require a judicious use of zoom, ISO speed and aperture to capture a decent image. The wild card in viewing the eclipse is weather. In general, the forecast is expected to be good to fair. Along the Colorado Front Range, we’re expected to have sky conditions featuring thin, high-level cloudiness. In Casper, WY, the closest point of totality, they are expected to have similar sky conditions. The level of cloudiness maybe enough to provide a momentary glimpse of the sun without protection. Regardless of approach, a total solar eclipse of this kind should not be missed. If you watch online or television, mute the sound. What matters is your sense of marvel and experience, not the commentator’s. If you click on the map above, you will redirected to Google’s Interactive Eclipse Map. Combined with their satellite street mapping, you are able to project the eclipse, partial or total, to your street address. At our house, we’re expected to have a partial eclipse of 88.892% at maximum. The shadows are expected to be similar to an early dusk twilight. The eclipse will begin at 10:23:40.7, reaching its maximum at 11:47:55.0, and ending at 13:15:59.4. 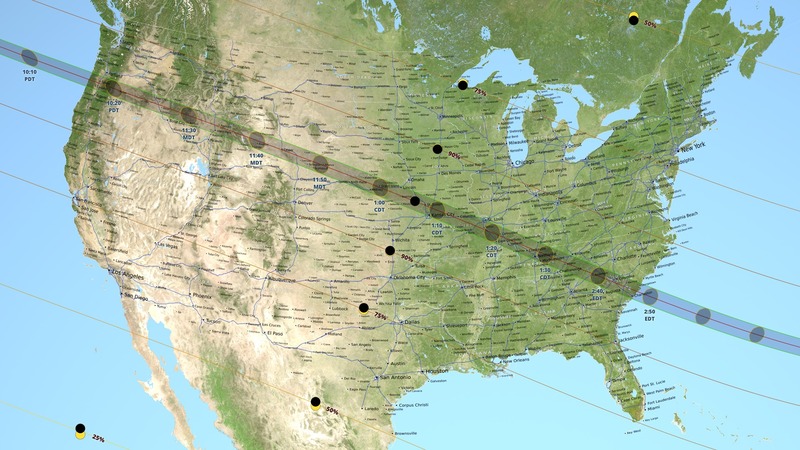 On August 21, a total solar eclipse will cross over North America, from coast to coast. What makes this more of a rare event, the path of totality will be entirely over continental United States. The narrow band will stretch from Salem, OR to Charleston, SC. A partial eclipse will be seen outside the band of totality. How much of a partial eclipse will be seen by those outside the band of totality is determined by how close they are to the band. In Colorado, for example, the partial eclipse will range from 85% (NM border) to 95% (WYO border). The last total eclipse through the western states was in October 1978. At that time, the partial eclipse was around 85%. In terms of light, it was similar to what one would expect at the beginning of evening twilight with longer shadows. With the coming eclipse, observers in Colorado should expect the same. If it is overcast, it should be darker – with the level of darkness determined by the thickness of the overcast. Under any circumstance, do not observe the sun without proper eye protection. If you choose to use eclipse glasses or viewers, it must be ISO-12312-2 compliant (meaning it meets the minimum safety standard to directly view the sun). The American Astronomical Society (AAS) has developed list of reputable vendors, which can be found here. The low cost (free), DIY approach is to make a pinhole viewer, consisting of a cardboard box (smaller the better) and an unused piece of bright white, multipurpose paper. Make a pinhole in the cardboard box, the white piece of paper is the projection screen. Before the eclipse, practice lining up the cardboard box over the paper. What you are looking for is the brightest amount of light coming through the pinhole. If you have a telescope, there is a good chance it came with a sun filter for your eyepiece. Line up your telescope without using your finderscope, which is fairly easy. With the sun filter in your eyepiece, line up your telescope before the eclipse begins. If your telescope came with a solar projection screen instead of a filter, it is the same process like using a pinhole viewer. The super-safe way of following the eclipse is to watch NASA, online or their TV channel (DISH Network and DirecTV). You’ll also receive a science lesson on the side. Photographs of a solar eclipse cannot be beat. If that is your plan, the plan should be nearly complete in terms of equipment and practice. If not, Canon USA has assembled a reference guide to photograph the eclipse – from an introduction to eclipse photography to equipment to site preparation. Whenever the Earth, the sun and moon line up for an eclipse, on occasion, the eclipse will come as a pair. Tonight, during the full moon phase, a partial lunar eclipse will occur. The partial eclipse will come around sunset for those in eastern Europe and Africa, and before sunrise on August 8th in the Far East and Australia. In North America, no partial lunar eclipse will be seen. An abstracted view of the total lunar eclipse that occurred earlier this month. Locally, there were several places where it was able to be observed with very little obstruction. For us, we have a decent view of the sky for astronomical viewing from the backyard. It is limited, by trees, when looking to the west and southwest. If the subject is low in the western sky, viewing is further restricted by the mountains. While the line of sight to view the eclipse, or many other astronomical subjects, is much better from the garage roof, climbing a ladder in the dark is not recommended. The final eclipse of this tetrad will occur on September 28, 2015. This graphic by NASA will indicate if the eclipse can be seen from your location. In preparation, may be, for tomorrow morning’s total lunar eclipse before sunrise. Saturday morning’s total lunar eclipse is the third in a “tetrad”, four total lunar eclipses in a row occurring at six month intervals. When the eclipse reaches its maximum, the moon will take on a deep red/rust color – hence the reference to the “blood moon”. Farther west an observer is located, better the view. In the USA, the Eastern and Central Time zones will not see the total lunar eclipse as the moon would have already set and daylight present. In the Mountain Time zone, the first rays of sunrise adding extra color to the sky may make for a special extra viewing of the totally eclipsed moon. The better viewing will be on the West Coast, and the best viewing will be across the Pacific, in Hawaii and points westward into the Western Pacific with darkened skies. The eclipse will be seen in Australia and East Asia on Saturday evening. Like all celestial events, viewing depends on the weather conditions. For additional information on the eclipse, please read here. If away from the city lights, another sight worth taking in will be the close proximity of the Milky Way. A darker sky will be needed to observe the Milky Way and the eclipse together. The better views will begin on the West Coast (USA), with the best across the Pacific expanse. For additional information on the Milky Way and lunar eclipse viewing in the same sky, please read here. With the long Thanksgiving (USA) weekend beginning later this afternoon, a photographic puzzle to ponder between football, turkey, treats, online shopping, etc. What is it? A darn good astronomical photo from my telescope? A sprinkling of salt or sugar on a black surface? A night-time shot through an iced-over window? Or, is it something else? You may leave an answer(s) in a comment. Conversely, you can wait for the solution that will be given next Tuesday, Dec 02, 2014. Update: The solution to the puzzle is that it’s an ice pattern on the window. The illumination is from an outdoor yard light. Cheers to Carlos and Lori who submitted their guess in the comments. Low on the horizon, the sun looms large. It’s all optical illusion. The same effect can be observed when the moon is rising and is just above the horizon. If you were to look, between your legs, you’ll see its size as if it is high in the sky.